One of my favorite ways to start the day here in Hanoi is to head over to the nearby French patisserie, where I can wake up with a perfectly prepared frothy latte and a flaky fresh-baked chocolate croissant or a warm baguette. When I come in the afternoon, I choose between my three favorites: a creamy St. Honore pastry, a rich Paris-Brest bursting with hazelnut praline cream, or a thoroughly decadent chocolate feuillantine cake. While this French-Vietnamese owned bakery is popular among Hanoi’s 10,000 expats, I often see more Vietnamese people here than I do foreigners. My meal, including the latte, never costs more than about $4, which I think is one of the best bargains in the city. Parts of Hanoi feel very Vietnamese, while other parts have a distinctive Chinese-influenced flair, but in this part of Ba Dinh District, it’s easy to imagine that you’re in Paris. 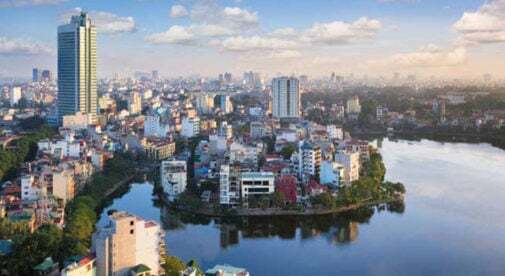 Less than a mile from the central business district and beautiful Hoan Kiem Lake, Ba Dinh District has wide streets lined with shady trees, planted by the French during their lengthy occupation of Vietnam. There are embassies, government buildings, mansions, and gourmet restaurants housed in early 19th-century, neo-classical French villas. My house is within walking distance of the huge Ba Dinh park, part of the Ho Chi Minh mausoleum complex. I live across the street from Hanoi’s oldest university, the 1,000-year-old Temple of Literature, and its large park. Lenin Park, which has the only remaining statue of Vladmir Lenin in Vietnam, is a 10-minute walk away. It’s fun to go there in the evenings, when local ladies come to exercise to the tune of Vietnamese disco music or Latin salsa. Those are the most well-known parks; but there are many others scattered throughout the neighborhood. Like the 30,000 trees growing in Hanoi, the parks were originally planned by the French, who valued the shade and open spaces where they could enjoy peace and tranquility. It’s a wonderful city to walk around, camera in hand, and take in the laidback atmosphere. There are also many lakes where you can relax and unwind. The smaller lakes are encircled with paved or bricked walkways, with plenty of places to sit down, while the larger ones have seafood restaurants and ice cream shops with outdoor seating along the shore. In the evenings, the promenades fill up with families, while the park benches are taken up by groups of friends or couples taking in the romance of the twinkling city lights. The French imposed a taxation system in Vietnam not unlike that in France, where buildings were taxed based upon the amount of space they took up on the street. Other than the grand French colonial mansions, most houses, including my own, are narrow, deep, and high, and are often referred to as “tunnel houses.” Although taxes have changed over the years, the building style has not. The best examples of these tunnel houses are in the Old Quarter, but you’ll see this style everywhere in Hanoi, where space is always at a premium. Vietnam also has an active café culture—another aspect of French influence. People enjoy spending their days out on the street rather than in their small apartments and homes, and coffee shops are found on nearly every block, always filled with customers. These are gathering places where it seems as if everyone knows each other; they pass the time discussing everything under the sun. You’ll also see coffee shops with names like Chat and Date and 18+ that strive to create a romantic setting where couples can enjoy each other’s company, along with a strong Vietnamese coffee. Hanoi is reminiscent of Paris, yet uniquely its own city. It can be busy and a bit chaotic, but its many parks, lakes, and coffee shops give it a romantic atmosphere which is unusual for a Southeast Asian city. It’s one of the things that I truly love about living here. Simply provide your email below to receive this Free report. You’ll also receive a free subscription to our International Living Postcards–a daily e-letter that explores living, traveling and investing in Vietnam and other exciting countries around the world.